Project funded by the International Technology Alliance programme in Network and Information Science between UK (MoD) and US (ARL). It investigated technologies and toolkits for joint network/security management and control of coalition networks. 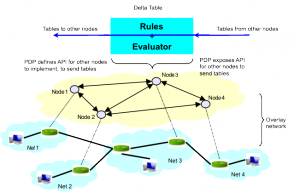 Specifically, a novel declarative distributed computing framework and systems have been developed for the specification of security and overlay network management protocols, and the evaluation and analysis of these protocols with respect to global properties (e.g. always convergence) and robustness assurance. Joint with IBM Thomas J. Watson Research Centre. Project funded by the International Technology Alliance programme in Network and Information Science between UK (MoD) and US (ARL). It explored methodologies, algorithms and tools for analysis of policy-based specifications and policy-based security management. Joint with the Royal Holloway College and IBM Thomas J. Watson Research Centre. An EPSRC project that investigated knowledge-driven mechanisms for protecting private information, typically generated from ubiquitous computing applications, from malicious or accidental misuse. To explored privacy requirements across the general population for a specific set of ubiquitous computing technologies and used them to produce a Privacy Rights Management (PRM) framework that enables users to specify privacy preferences, to help visualize them, to learn from the user’s behaviour what their likely preferences are, and to enforce privacy policies. Joint with the Open University and part of the IBM Open Collaborative Research Initiative. A five year platform grant addressing issues in: adaptive software environments; policy and security; and requirements engineering and modelling. The first Platform Grant completed 31 July 2007 but it was renewed for a further 5 years. It provided baseline funding for the Distributed Software Engineering section.